Malini lives with her parents and young sister, Banni, in northern Sri Lanka. 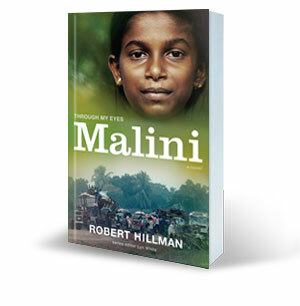 As the civil war heads towards its catastrophic end, Malini and her family are herded by Tamil Tiger troops towards the coast where they will act as human shields, along with thousands of other Tamil civilians. When Malini's father pushes a mobile phone into her hands and tells her to run off into the forest with Banni, Malini does as she is told. But then the shelling begins, and Malini has no way of finding her mother and father. With the role of parent thrust upon her, Malini has no choice but to travel to her grandfather's village a long way inland. She and Banni will need to keep off the highways and stay alert for soldiers from all sides. But where will the next meal come from? Who can they trust? Where will they shelter? And will they ever be reunited with their parents again? The uplifting story of one girl's odyssey through war-torn Sri Lanka.